Thanks for providing a lot of knowledge in one website.It will surely help people getting information about different courses in one website,specially about Gate. to inspire and Train students towards excellence. thanks for providing information ....it will definetly helpfull for candidates! 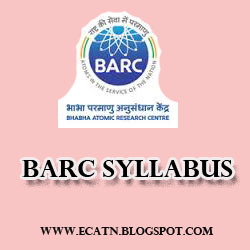 do we have aptitude part also in barc exm for ece? what is the cut off for the online exam ? do we have mathematics in barc?? Sir, I had applied for the Information Technology stream in Bhabha Atomic Research Centre (BARC, but unable to download the BARC Syllabus 2017, for the IT stream please help me by providing some appropriate link to download the syllabus.